Ruben Brandt, a famous psychotherapist, is forced to steal 13 paintings from the world's renowned museums and private collections to prevent his suffering from terrible nightmares he has as a result of subliminal messaging he received as a child. Accompanied by his four patients, he and his band of thieves strike regularly and with great success: the Louvre, Tate, Uffizi, Hermitage, the Museum of Modern Art. "The Collector" quickly becomes the most wanted criminal in the world. Gangsters and headhunters chase him around the world while the reward for his capture keeps rising, approaching a hundred million dollars. A cartel of insurance companies entrusts Mike Kowalski, a private detective and leading expert on art theft, to solve the "Collector Case." 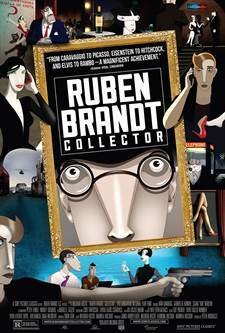 Download Ruben Brandt, Collector in Digital HD from the iTunes store. Ruben Brandt, Collector images are © Sony Pictures Classics. All Rights Reserved. Amination can take on many forms and formats. They can also tell varying types of stories, from Disney's "happily ever after" tales to darker fare like we saw in this year's Oscar winner, Spider-Man: Into the Spiderverse. Then you get animated movies that are more mature in nature such as Anomalisa and the raunchy, R-rated comedy Sausage Party. Throw all those out the window and you get a piece like Ruben Brandt, Collector. Highly stylized, this first feature from Milorad Krstić is visually as much of a masterpiece as the works of art it highlights. Ruben Brandt (Ivan Kamaras; Hellboy II: The Golden Army) is a celebrated art therapist. Generally, that means a counselor who uses art as a way for patients to express their emotions in aiding with their therapy. However, for Ruben, it means literally treating "artistic souls" including those who steal art for a living. Brandt also has his own issues as well and he suffers from terrible nightmares where famous paintings come to life and try to kill him. When he takes on a patient named Mimi (Gabriella Hamori; Budapest) she suggests the way to treat Ruben's nightmares is to obtain the paintings themselves so Ruben enlists the help of Mimi and his other patients to do what they do best… and steal the selected paintings from his dreams. Complicating this scenario though is a government agent by the name of Mike Kowalsky (Zalan Makranczi; Chameleon) (isn't that the name of the main character in Monsters, Inc. ?) who is not only chasing Mimi but the paintings as well. If that wasn't enough there are also mobsters after Mimi and therefore the whole gang of art thieves. As mike researches this "collector" he discovers that Brandt's father was a famous CIA agent who worked with subliminal messaging and often experimented on his son Ruben by inserting pictures of famous paintings into cartoons. Of course, these are the paintings of Brandt's nightmares. While the plot is loose and has lots of holes, the focus of this film is the visuals. Even if you don't know the names of every painting flashing across the screen you are aware that you are witnessing masterpieces from almost the first frame. The viewer, at least this one, wished the film had been longer if for no other reason than to enjoy the stunning artwork. Sadly, the story needs more structure from start to finish. While Ruben was fully formed, none of the other characters were and yet some of them were more interesting. Mimi is really the focal point of the movie and I was eager to know more about her story. Kowalski is rather one dimensional but you suspect there is more underneath, especially when he discovers a secret towards the end of the film the undoubtedly "rocks his world". The juxtaposition of the colorful and vibrant pictures is a feast for the eyes whereas the lacking plot leaves you desperately yearning for more. Krstic takes a risk with this movie, especially considering it is his first feature. I wish I could say it completely pays off but it doesn't. Don't get me wrong, it is far from awful and the concept is unique enough to be intriguing. It also makes me wonder what we can expect from Krstic's sophomore effort. If nothing else this should have investors looking to finance Krstic's next foray into animated feature filmmaking. If you like the unusual or the Avant-Garde this is certainly a film for you. If you just want to try something different for a change, I can recommend Ruben Brandt, Collector.